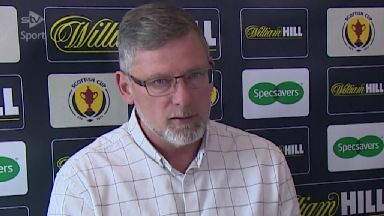 Hearts manager Craig Levein wants fans who bring shame on Scottish football to be banned from stadiums for life, after allegations of racism and pyrotechnics being thrown at the Edinburgh derby. The match between Hearts and Hibernian at Tynecastle Park last Saturday involved delays as ignited smoke bombs were thrown on the field of play. A coconut was hurled on the pitch in the aftermath of Hibs' equalising goal in the first-half. On Monday, it was confirmed that three men had been arrested, including a 38-year-old accused of using racist language. 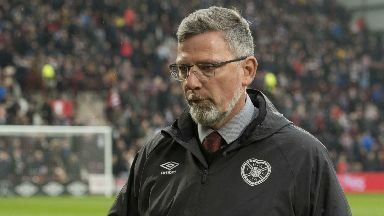 Levein said: "It drives me nuts. If you're going to a game with a flare you are going for one reason, and that's to cause trouble. "If we catch them they should be banned for life, it is as simple as that. You are going there with that intention. It is pre-meditated. "It always falls back on the clubs to do something about it and I know how hard we are working to eradicate this. "But basically it comes down to some idiots who are intent on getting into the stadium to cause a disruption. 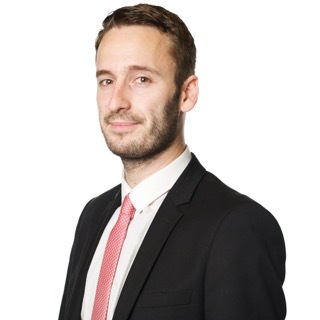 "It is a sporting event, it's not something where people coming along should have their entertainment interrupted for five or ten minutes by some nutter throwing stuff on the field. "I think we should be as hard as possible on these people if get them." Asked specifically about the alleged racism, Levein added: "It is sick isn't it? There are idiots in every walk of life. "It just doesn't compute why you would even consider doing something like this. "It gets quite depressing when you come in and you are constantly talking about stuff that is just people being a*******s."
Hearts face Inverness in the Scottish Cup semi-final this weekend and Levein knows his supporters will be desperate for a result to lift them after losing the derby. The Hearts boss said: "The cup semi-final itself is something that I have been very much looking forward to. "Of course we would have loved to win the game going in to this match but I don't think it will have any bearing. "I don't feel under any more pressure than I put myself under because we lost on Saturday. There is always part of you that wants to make up for that as quickly as possible. "The derby match is sore, especially when you are not used to losing those games. I always try to take the positives out of the game and not let any disappointment linger. "And we get another opportunity to get one over on Hibs very shortly actually. So we'll focus on the positives we could take out of the game and use them for Saturday."